A few years back whilst working at Airbus I chose to invest. I used up my ISA allowance, so I was advised by my local bank that an investment in their stocks and shares savings account thingy would be a good idea. All looked good on the graphs and things, with lots of things invested in across the board, perfect I'll do it. Only one problem, this was September the 10th 2001. Oddly enough my shares plummeted in value over the next few days..
Oh well I'll continue to invest in Moths instead. Being a sophisticated bit of kit current Moths are quite expensive. 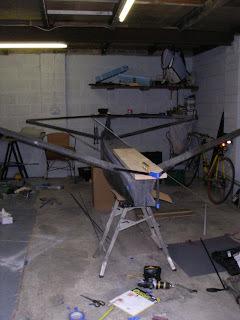 My route into the fleet has always to build / finish my own boats. You don't have to build from scratch, as this is a long process, but buying the key elements and finishing it off is a viable option for many people. 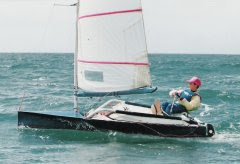 Doug Culnane and I had chatted during the Denmark Worlds about designing an easy to build boat, and the Flasheart was born. 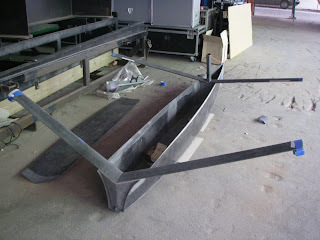 (Woof Woof) Flat panels, joined over a simple mould was the order of the day. Doug was keen to press fwd and we pressed print on the design after only the first iteration, mindful of the benefits of getting on the water. I think a Flasheart 2 could be made even easier to build, and its something I’d like to work on. I especially like the flat pack design of the Slino moth on the Perverted Moth Blog. It is great to see many other Moth build projects out there. The other version of this is of course the Carbon Footprint project, using an old boat for the key components and giving it a new lease of life. She is all finished and on the trailer outside, just waiting for a weather window to launch in, but that is a post for another day. With the Weapon on the market it seemed like a good time to publish some photos of her being built as she had a rather interesting build. Several different locations, and a lot of miles on the road, for a very last minute Garda Worlds campaign. 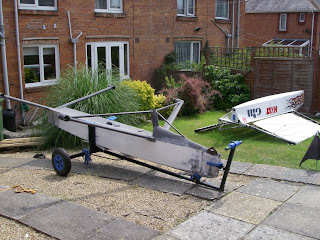 I purchased a Mistress 3 hull and deck from Full Force in shiny new prepreg carbon, collecting it just before Christmas 06. It went back to my parents house with me for Christmas and I pondered the changes I'd been considering. 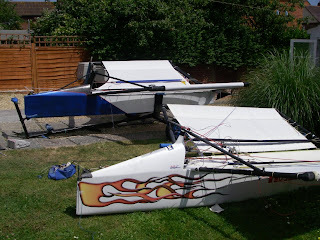 I was keen to have some aerofoil wingbars and through my Tornado links with Marstrom I managed to get hold of a test A class cat mast, and set about hacksawing it up into Moth wingbars. I was also keen to make the bow a bit finer and smaller than the original m3, so I jigsawed down the bow, opened it up a bit, and stuck in some foam. 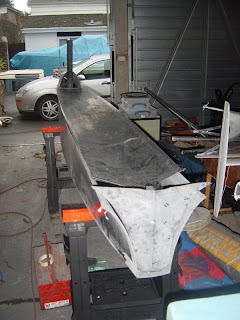 This enabled me to reprofile the bow, and cut off some excess off the transom as I was also keen to have a slightly higher volume transom. 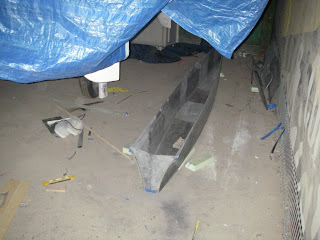 The original transom was removed from the deck, and a new angled one made to match the angled forward rear wingbars. 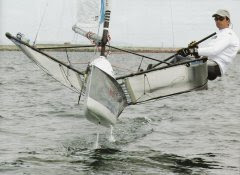 Freeboard was also dropped slightly. 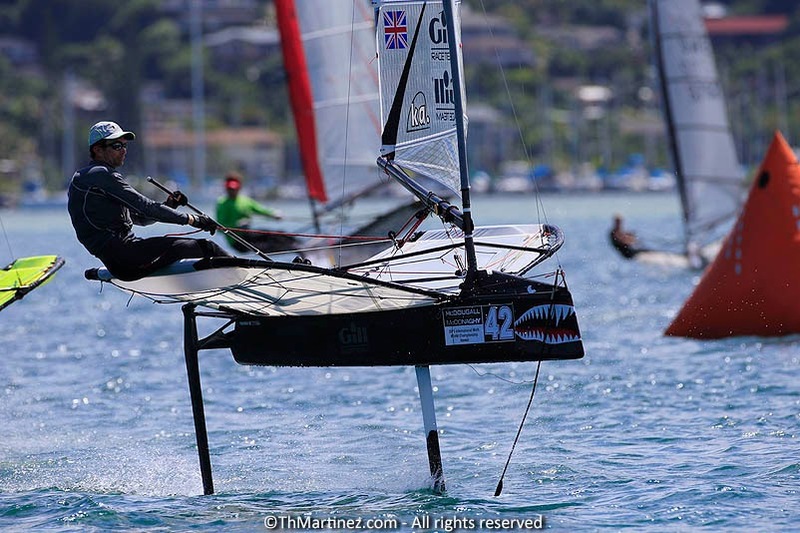 Then I went out to Miami coaching, and on my return I went straight out to Valencia to work for Victory Challenge through AC32. 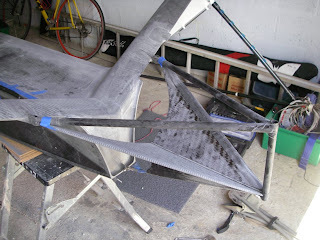 While many would suspect a Moth built within the midst of an America’s Cup would enable you access to an awesome build facility with a whole host of tools, gadgets and people. The reality isn’t quite like that! Victory Challenge was a relatively small team, that was pushed for time, so we don’t have much time for exciting little projects like the Moth. Sure I’ve picked the brains of some smart people in the know, made many useful contacts, but I was never going to see the benefit whist in the thick of it. An America’s Cup base is purely the domain of AC yachts and the associated kit and support vessels that go with them. There isn’t actually much spare space on site for the construction of something even as small as a Moth. 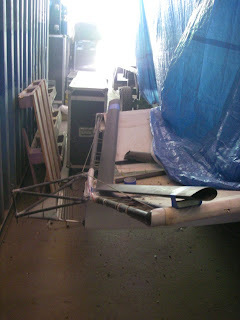 So construction took place under the tarpaulin covers of the Swedish Match 40’s the team used to use for Match racing, and are now in storage amongst a pile of containers behind the base! 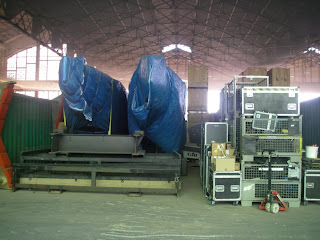 Here is Nemesis tucked in under the 40's with AC Television kit now blocking us in. 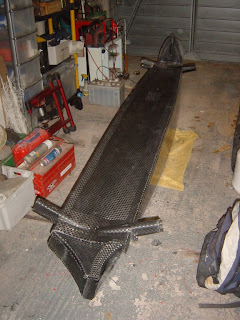 The photo below shows the rear wing bars being mocked up to check angles before bonding. You can just see the Gill sticker on Nemesis showing through the gap. 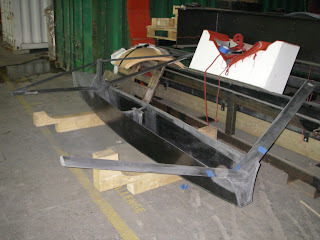 After early small parts production, the new boat lived on the lifting framework just out in front of the 40's. The security guards were friendly, although they were baffled by what I was building! I needed to show accreditation to get into the container area that was Moth central! After a long day on the base and out on the water, I'd try to get a few hours in my mini workshop late at night to do a few key jobs, operating out of my trailer! Just before going to Valencia, I'd bought my house in Weymouth, or rather I'd bought a workshop with a nice house attached! So it was straight back into there. Deck on and gantry nearing completion. I went to Garda via Kiel, as I was coaching the Paralympic team out there. I finished putting the fittings on in Kiel, then drove on to Garda to launch her! Perfect regatta prep, but I had less isssues at the regatta than mos. And if only I knew then what I now know about wands, the downwinds might not have been so sketchy. There you go, a little insight into a silly bit of Moth building against the clock, and a lesson in how not to prepare for a World Championships! Good fun though.. and I was one of the most photographed boats there.